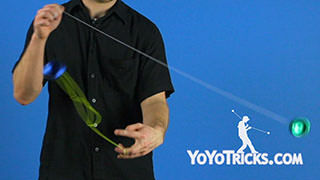 Learn the 3A trick known as Razor Leaf. Before you learn this trick, you want to make sure that you know how to do the 1.5 Kink Mount, because that is essential to the beginning. 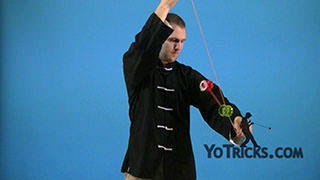 You also want to know how to do Shima Wrap, because that is the most basic wrap, and we use a lot of those techniques in this video. 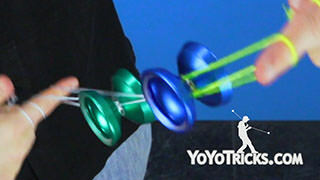 This is the very first wrap that we are going to do in 3A that involves a Kink Mount. It is really easy to learn because during the wrap we actually undo the kink, and that it makes it easy to get out. So it is a great one to start with. 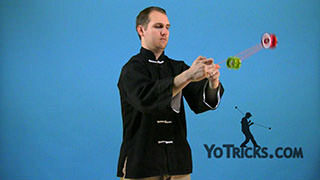 To start off, we will practice just our dominant hand. So what you are going to do is throw a 1.5 mount just like this. 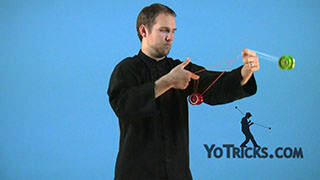 The first step is to unmount the yoyo. Then take your dominant index finger. Pinch the string. 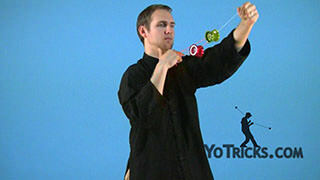 Take the yoyo and continue that momentum and throw it over you opposite wrist. 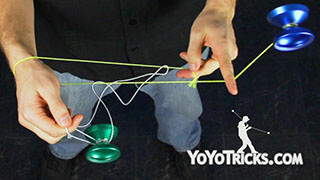 You will see that string right there, can be mounted on it. That gets you into an Undermount on your wrist. 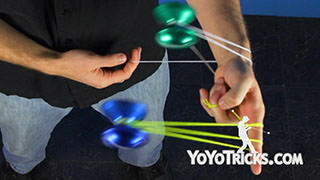 To dismount, all we are going to do is roll the yoyo towards our self. To do that, we are really just going to pull up with the dominant hand. 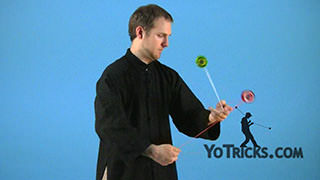 That will help unwrap the yoyo just like that. It dismounts in the process. That is primarily all that we are doing with our dominant hand. Once you have got that down and you are feeling comfortable, what you are going to want to do is get into your kink mount. Just like this. 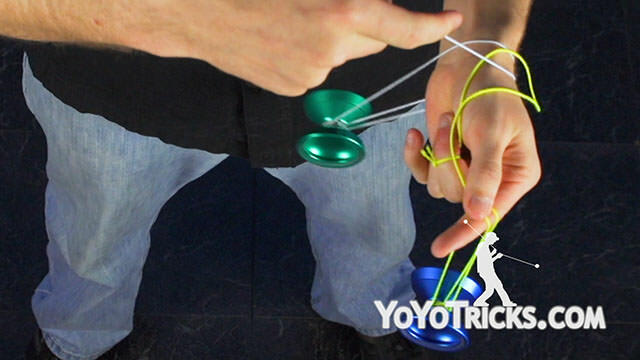 Unwrap the yoyo, pinch, throw it over your wrist, mount it onto that string. 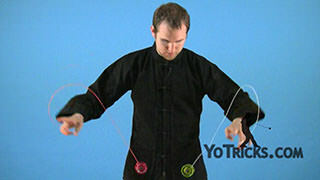 Then you can let go with your index finger and you will see you are in this configuration. 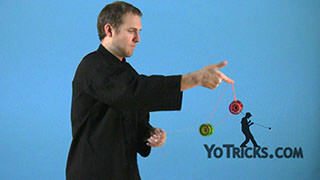 The next step we are going to do is take our non dominant yoyo, just this yoyo, and we are going to throw it in between our arms. 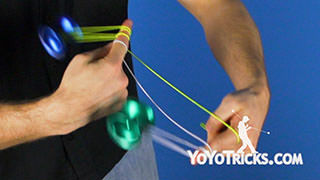 Over this string on the inside of it. Just like that. 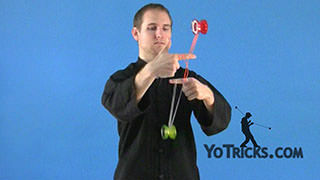 Let go of the yoyo and you will see that actually undoes the kink mount at this point. So I can get out of it just like that. Once you have done that, all that we are going to do to remount is grab the string with our dominant index finger. 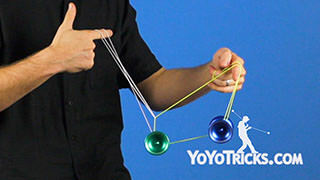 Mount the yoyo up. 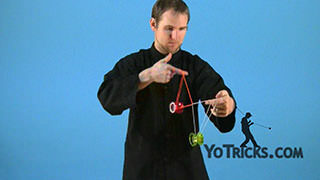 This is essentially just like a keychain mount or similar to the mount that we did in Shima Wraps. From here, I will show you again, unmount, get it over your wrist. 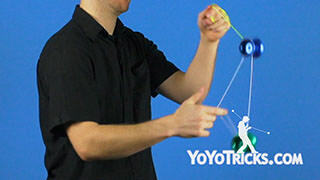 Again, take that yoyo, drop that index finger, and your non dominant yoyo comes inside of this string. Let go. 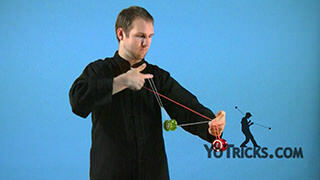 Grab the string with your dominant index finger. Remount the yoyo. 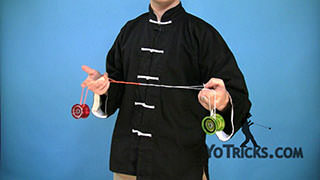 From here you basically do the opposite motion of Shima Wraps. 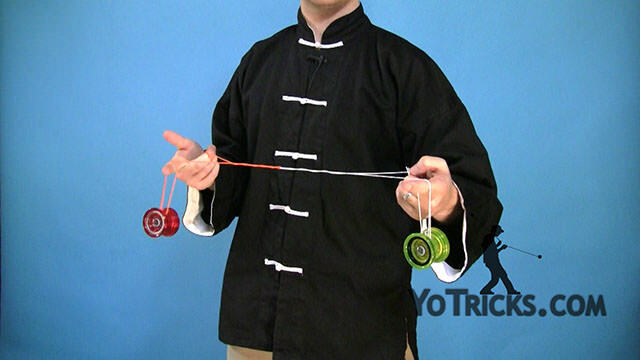 So you are going to roll both yoyos towards yourself. 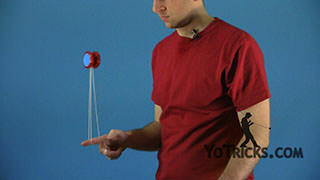 Dismounting this yoyo at the same time. You will see it comes off. 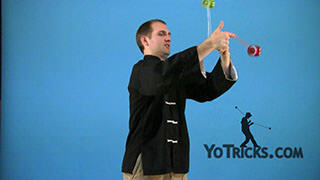 Usually what I like to do it continue the momentum and perform a whip like that. 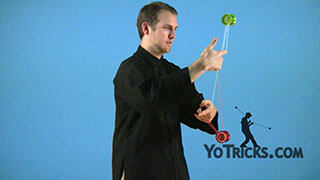 That gets you with both yoyos in your hands so you can bind them how you like, however you usually like to throw them off to the side and perform like a gunslinger bind. Something like that, however you can get them back to your hands. Once you have got it down, that is how you do Razor Leaf.